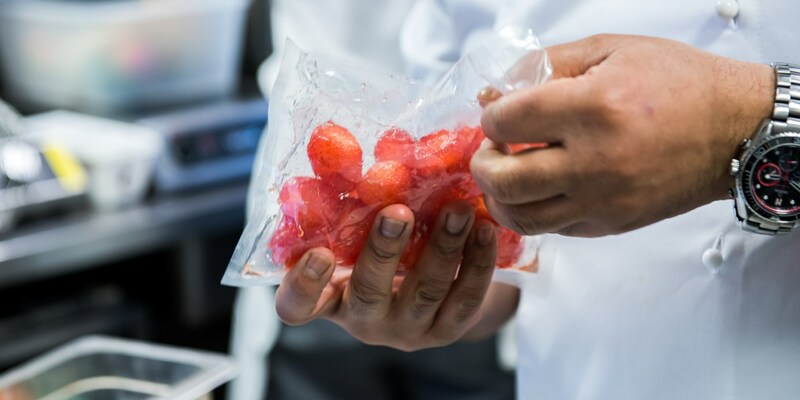 Sealing fruit under vacuum with a marinade imparts flavour without having to wait around for hours to get the desired result. The strawberry flavour will be more pronounced as will the flavour added to the bag. Less liquid and flavour are required than in traditional methods of maceration. Different complementary liquids can be used in the bag with the strawberries, why not try using champagne, honey or balsamic vinegar. If using vinegar be sure to use a smaller amount and use the strawberries straight away or the vinegar will start to break them down. You can also add flavourings to the bag such as basil, mint, black pepper or elderflower. Serve macerated strawberries with ice cream, panna cotta or Eton mess. Substitute the roasted strawberries in William Drabble's pain perdu recipe for macerated ones or, for something totally different, try Dave Watts' recipe for scallops with balsamic vinegar-macerated strawberries.